First off, we have a short modification list for this bright red 2014 Chevrolet Corvette Stingray Z51 Coupe and to make enough power to run in the 9 second quarter mile range – the new C7 only needed a revised set of cylinder heads, a high performance camshaft, long tube exhaust headers and a 150 shot of nitrous oxide. This car is also equipped with a high stall torque convertor to help get the 2014 Corvette off of the line as quickly as possible. I also have to wonder if this Corvette doesn’t have an aftermarket exhaust system as it is very, very loud but in the long run, the only modifications that really make a difference are the heads, cam, headers, torque convertor and the nitrous setup. It should also be noted that this car is wearing the factory wheels and not a set of lightweight drag racing wheels wrapped in race tires so there is a good chance that this Corvette could have driven to the track and run in the 9 second range. 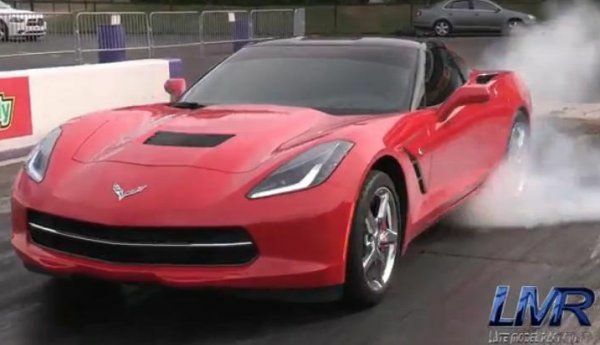 Aside from the fact that this 2014 Chevrolet Corvette Stingray Coupe is able to rip down the quarter mile in less than ten seconds, there are some other aspects that are really incredible. First of all, for a car that does not appear to be equipped with a drag racing suspension setup or racing specific tires/wheels, it leaves the line remarkably well with no wheel spin – just a hard launch and away it goes. Next, take note of the quality of the shifts. We know that this Corvette has a torque convertor but that doesn’t have any real impact on the shifts and when this Corvette pops from gear to gear, the changes are lightning quick and as smooth as we have seen from some of the world’s most expensive supercars. However, unlike many Ferrari and Lamborghini models that offer similar lightning quick shifts with a dual clutch transmission, the new Corvette relies on a traditional fluid driven automatic transmission. This does a great job of showing what an old school automatic transmission can do and it could be doing it in near-stock form. In the end, this awesome 2014 Chevrolet Corvette runs through the top end of the quarter mile in 9.999 seconds at 132.70 miles per hour. While the modifications of heads, cam, headers, torque convertor and nitrous setup won’t be cheap, there are all fairly common modifications for Corvette owners who want to go faster than an average Corvette so there is a good chance that we could see a great many C7 Stingrays tickling the 9 second range when racing season hits at full force next spring. In the meantime, crank up your speakers and feast your eyes on the first ever 2014 Corvette to run the quarter mile in the 9 second range.